With so many trails and bike-friendly communities, Nebraska is no stranger to bike shops to serve both beginner and avid riders. 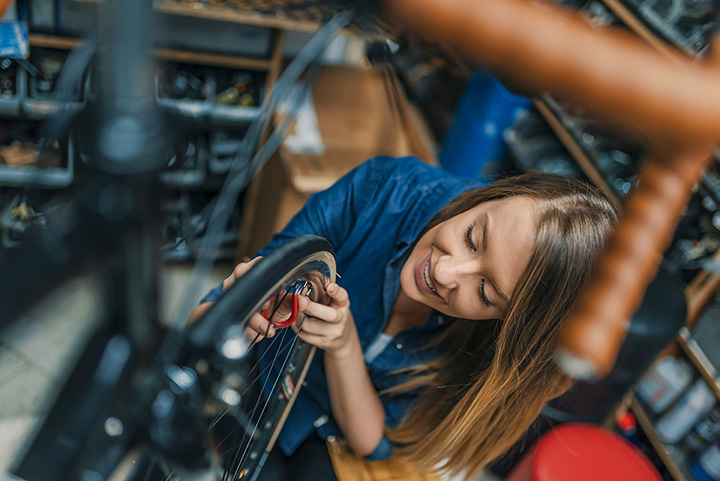 Whether you’re looking for a new set of wheels, a repair, or equipment to make your next ride great, there’s a great Nebraska bike shop that has what you need. Below are our picks for the 10 best bike shops in Nebraska. Cycle Works is one of the best bike shops in the city of Lincoln. The shop has a great selection of bikes and friendly service that will help you select the perfect bike that fits your personal style and cycling needs. Olympia Cycle in Omaha has been around since 1971 offering expert bicycle repair and consultation services. Don’t leave your biking needs to chance—stop in for expert advice or to pick out the bike of your dreams. Sonny’s Bike Shop Inc. is another local favorite that has been in operation since 1972. The shop offers custom built rides as well as a collection of vintage bicycles to fit every taste and cycling need. The locally-owned Bike Rack has also been around since 1972 promoting cycling in Omaha with the best products thanks to its highly-trained staff. Located in charming downtown North Platte, CycleSport Bike Shop is the hub of cycling in the area with access to miles and miles of country roads and popular trails. ReCycled is a charming bike shop in Lincoln that offers an incredible selection of budget friendly, refurbished bikes as well as a large selection of modern bikes for everyone. They also accept trade-ins so you can trade up your old ride. The Bike Shed carries a full line of bicycles, equipment, accessories and parts for lovers of the sport in Kearney. The friendly staff will help you get everything you need to start riding! The crew at Joyride in Lincoln has an obsession with providing the best in cycling stock and expertise. They have the know-how to get your bike up and running again or to build the custom bike of your dreams. The Omaha Bicycle Co. offers a welcoming space for the biking community in the city. The combination bicycle/coffee shop also offers a great selection of bicycling apparel. Trek Bicycle Store in Omaha is where the pros go as it’s located super close to some of the best riding areas in the state. The fun and extremely knowledgeable staff help dozens of newbies and families get connected to cycling every day.